“Teresa Carreño, the flamboyant and temperamental ‘Walküre of the piano’, was one of the most powerful and influential women in music in the latter half of the nineteenth century. Carreño was also highly regarded as a singer and as a capable composer working within expected stylistic limitations of her era. 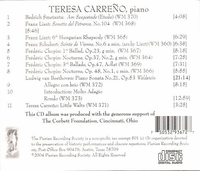 Pierian Recording Society's ‘Teresa Carreño: Pianist’ gathers all of her Welte-Mignon piano rolls in one place, (minus her Schumann ‘Fantasia, Op. 17’). While she happily produced piano rolls for a variety of companies, Carreño never made phonograph records. There is still considerable controversy among pianophiles as to what degree any reproducing roll is capable of in delivering the actual playing of a given pianist, especially as all rolls were edited by another hand. These Welte rolls of Carreño, made in 1905 and among the first produced by the company, appear to be honest, played at the right speed and presented in a pleasant, non-reverberant parlor ambience in Pierian's well-recorded rendering. It is extraordinary how serious Carreño's choice of repertoire is compared to the average established in piano rolls made by other, even male, pianists of her day. There is none of the glittery, ostentatious salon music common in Carreño's time to be found here, instead we find Liszt's ‘Sonetto del Petrarca No. 104’, Chopin's ‘g minor Ballade’, and the whole of Beethoven's ‘Waldstein’ Sonata in the first recording of any kind made of the work. By current-day standards, Carreño is nowhere near the standard approach in any of this material - the loose tremolandi and independence of hands in the opening of the ‘Waldstein’ will make many a fan of Alfred Brendel shake their heads in disbelief that anyone could have taken Carreño seriously. However, they would miss the subtle elasticity of her approach to tempo, a romantic conceit that is simply out of favor in the current context. This works a bit better in her Liszt ‘Petrarch Sonnet’, which radiates from a deep reservoir of romantic feeling and is quite unlike the established standard, and the sheer excitement felt in her Liszt ‘Hungarian Rhapsody No. 6’ is palpable. That she was aware of Bedrich Smetana's piano music at all is in itself amazing, let alone that she would record his etude ‘Am Seegestade’ and do so with zest and enthusiasm as here. “Teresa Carreño was born in Caracas, Venezuela, on 22 December, 1853. Her father Manuel Antonio was a prominent politician (and amateur pianist); her grandfather Caetano Carreño was a distinguished Venezuelan composer. With her father as her principal teacher, Teresa showed extraordinary musical promise at an early age. Her earliest compositions, short piano pieces, date from her sixth year. The brilliance of her piano playing soon provided the decisive impetus for her family's decision to leave Venezuela, in order both to bring her to broader attention, and to complete her musical education. For the next ten years or so, her father was also effectively her manager. In the summer of 1862, the family traveled to the United States, settling in New York City. Teresa made her début in New York's Irving Hall on 25 November 1862. During these first months in New York, she met the New Orleans-born pianist-composer Louis Moreau Gottschalk who spoke highly of her playing, and gave her a handful of lessons. In January 1863, she performed for the first time in Boston, and her first published composition, entitled ‘Gottschalk Waltz’ and dedicated to the composer, appeared in Boston later in the year. In March she traveled with her family to Cuba, where she continued to meet with great success. In the fall of this same year, she performed for Abraham Lincoln in the White House. In March 1866, the family sailed for Europe, and after a brief stay in England, proceeded to Paris, where they settled. Within days of her arrival there, she had performed for Gioachino Rossini and Franz Liszt. During her period of residence in Paris, she became acquainted with other famous pianists and composers on the Parisian scene, Charles Gounod and Camille Saint-Saëns among them. A brief trip to England during the summer brought her to the attention of London audiences. Throughout the later 1870s and 1880s Carreño continued to concertize indefatigably. In an attempt to escape the tyranny of the keyboard, she pursued a career (briefly but with some success) as an opera singer, and in January 1876 she made her début in New York City as Zerlina in Mozart's DON GIOVANNI. During these years she also made the acquaintance of the young Edward MacDowell, a highly gifted pianist whose youthful compositions she began to champion as early as 1883. As the twentieth century unfolded, Teresa continued to expand her sphere of action, making two world tours, the first in 1907-08, the second in 1909-11. Both trips took her to Australia and New Zealand; the second added South Africa to the itinerary. In November 1912 she marked her fiftieth anniversary as a concert artist in an elaborate celebration in Berlin. She remained in Europe during the first two years of World War I, though touring became more and more perilous. Finally, in September 1916, she abandoned Berlin, and traveled, for the last time, to the United States. Teresa Carreño was one of the most accomplished pianists of her day, and the recordings that she left give eloquent testimony to the elegance and refinement of her playing. The enviable brilliance and élan of her youthful piano pieces makes her later neglect of composing particularly regrettable. Her nickname, the ‘Walküre of the Piano’, encapsulates something of the high energy that she brought not only to her playing and composing but to life itself. Pianist Claudio Arrau, another South American-born child prodigy, heard her perform in Berlin in 1916. Recalling her playing later in life, he said, simply: ‘Oh! She was a goddess!’"